Poaching is a great method for preparing meat – if you do it right. It enriches a dish by giving the broth extra flavour. Bring two litres of water to a boil and add the beef broth and bonito flakes. Poach the beef tenderloin in the bouillon. Cut the beef tenderloin in thin slices and strain the bouillon. Cook the green tea noodles. Finely cut the green parts of the onions and leave in ice water. Clean the bok choy and blanch briefly. Twirl the noodles around a fork and then place them in bowls. 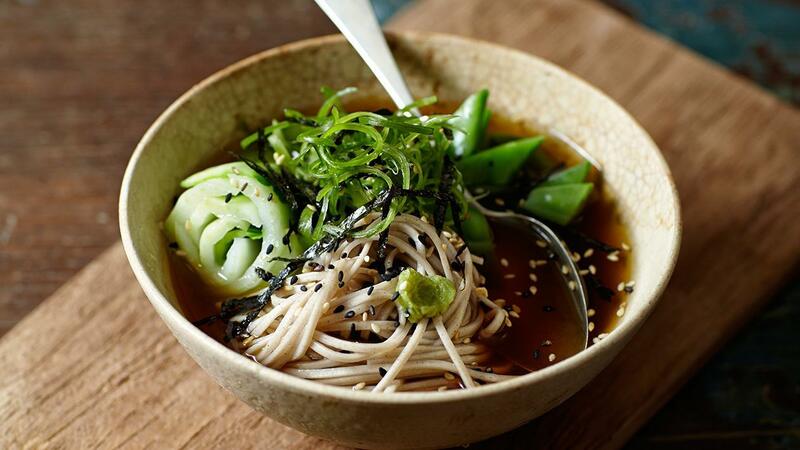 Divide the bok choy and seaweed salad and add the greens of the spring onions on top. Top the dish off with a sprinkle of sesame seeds. Pour on the hot broth at the table.